Angel tattoos can be appreciated by individuals of nearly any religion. These spiritual beings fulfill important jobs working as messengers, protecting faith and making the gap between mankind and the afterlife a little smaller. 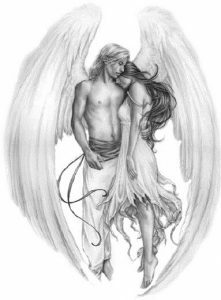 It is no surprise that angel tattoos are so popular for both men and women since they represent beauty, love, protection, faith, peace and innocence and of course, they keep evil away from the wearer as well. Angels are anthropomorphic, meaning they are believed to be human-shaped and winged. They are personified in almost every religion as messengers and in the Christian bible, they are capable and allowed to deliver both protection and punishment as they are told. Individuals who practice the Christian religion believe that angels take direct orders from God to carry out his will for mankind. See Religious Tattoos! In the Catholic church, some of the most intellectual spiritual beings are the Guardian angels. They are designated their chosen ones on Earth and are expected to protect, care for and guide them. It is their responsibility to fulfill their mission of assisting their assigned individuals to achieve eternal salvation. Angel tattoos are inspired by the most recent interpretation of what their appearance is believed to be. Although some characteristics have changed through the years, artists have held true to depicting them as winged, mystical creatures. They are traditionally clothed in white robes and seen drifting carelessly on fluffy clouds, suffused in blinding light. Also see Wing Tattoos. There are many items that are associated with these beings that are often incorporated in the design of angel tattoos. Harps, trumpets, swords, wands and crosses have all found themselves displayed with an angel at one time or another, whether they are all believed to actually be held and used by the angels or not. In history, angels were typically portrayed as young men who were winged, wearing a halo. It wasn’t until the Renaissance Era when brilliant artists offered a different representation of them being babies or young children, giving birth to the image of cupid. Angel tattoos are most often worn as a symbol of spirituality, faith, devotion, guidance and protection however, there are also the dark versions of these subjects as well. Fallen angels and the Angel of Death are often inked on the skin of individuals for their own reasons too. Angels have been a part of the world’s religions throughout history so it only makes sense that angel tattoos would be so popular in many parts of the world.